Every evening, I get to go on one of my favorite adventures. Mom and I (and sometimes Dad) go walking across our property and through the vineyards. 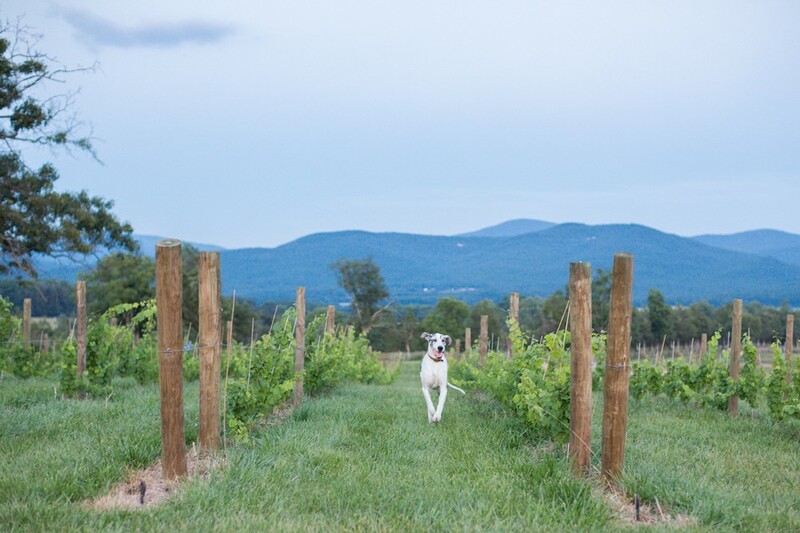 There are all sorts of delicious smells in the air from the creatures that I share Six Penny Farm with, and we also get to check on all of our growing vines. I love the golden hue they take on in the dusk hours. Often when I hear my mom and dad talked about our grape vines, I hear them use the words vinifera and hybrid. It actually took me a while to figure out that they were even talking about grapes. After some careful deducing, I determined that vinifera is actually a shortened version of the subspecies vitis vinifera, or the grapevines native to Europe. Vinifera are the most well-known of the grapes, and the cultivars (or varieties) possess the names we commonly see on varietal wines, such as cabernet franc, viognier, and petit verdot. Sometimes the different grape cultivars in the vinifera family intermingle with each other creating a cross. Two common examples of this are cabernet sauvignon (with a parentage of cabernet franc and sauvignon blanc) and chardonnay (with a parentage of pinot noir and gouais blanc). There are numerous less commonly known subspecies in the vitis species. Many of these are native to America and have varying degrees of usefulness in the wine industry. They are sometimes used in hybrid propagation because of qualities such as pest resistance and cold hardiness. Vitis muscadinia produces muscadine grapes which have earned their name in port-style and dessert-style wines. The vines, however, are not used to create new cultivars with any other members of the vitis family because muscadinia grapes have 40 chromosomes while the rest of the vitis grapes have 38. Thus, even though these vines are extremely pest-resistant, they are of no use in hybrid creation as they produce infertile cultivars. Vitis labrusca is most well-known for its concord and niagara grapes, and is often characterized by its foxy musk. Extremely cold-hardy, this subspecies is used to create hybrids for the northern regions of the United States. Vitis riparia grows naturally over almost all of the eastern portion of North America, and it doesn’t have the foxy quality of v. labrusca. Because of the appealing taste and abundant clusters, it is often used in juice and jam making. Vitis aestivalis is most well-known for the Norton grape. The grapes from this vine have vinifera like qualities and the vines are extremely hardy. Vitis mustangensis is the least useful of the subspecies. It produces grapes that are very acidic and bitter in taste. This quality is not appealing to the taste-buds and the high acidity can cause discomfort to the skin if handled. Figuring all of this out sure helps me to know more as I am walking through our vineyards. My wine knowledge is growing nearly as fast as our vines, and I am so happy to share it all with everyone reading my blog. If anyone has any questions, comment below and I will do my best to answer them. What Are These Brix, Anyway? It’s Harvest Time!